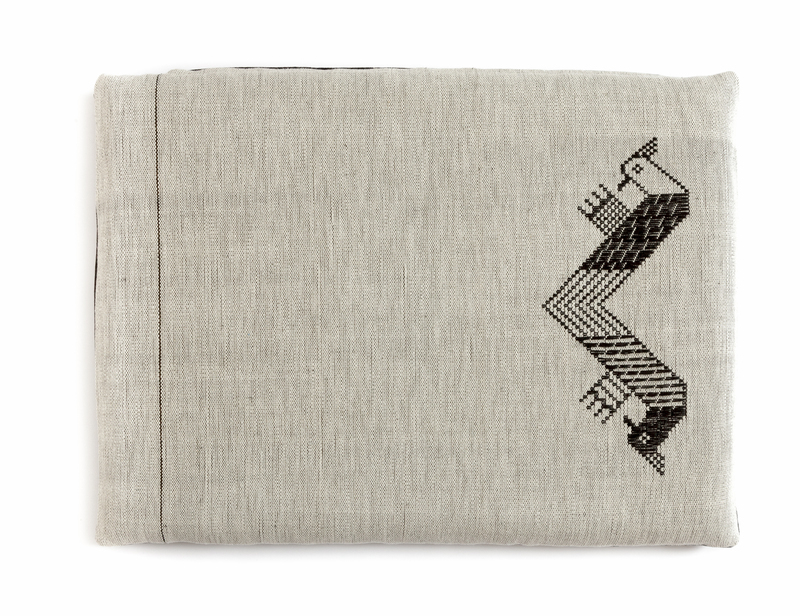 This cushion features stylized peacocks, a reinterpretation of traditional patterns with an innovative and balanced composition. Tapestry featuring a sophisticated floral motif, woven with light blue linen and silver threads on a neutral field. The elegant artefact is decorated with a pattern typical of Mogoro's weaving tradition, richly refined following the a bagas technique on a flat handloom. 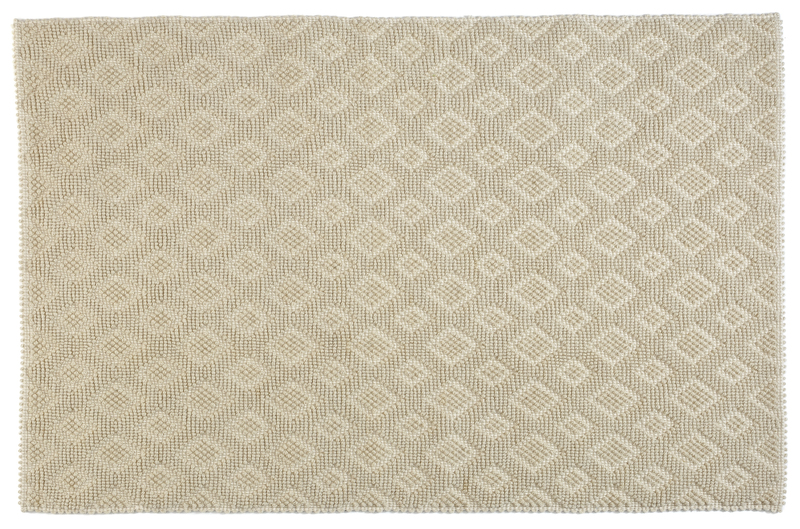 Elegant in its harmonious geometric composition with small rhombuses, this large hard wearing carpet in natural white Sardinian wool is realised using the refined artisanal a pibiones relief technique. 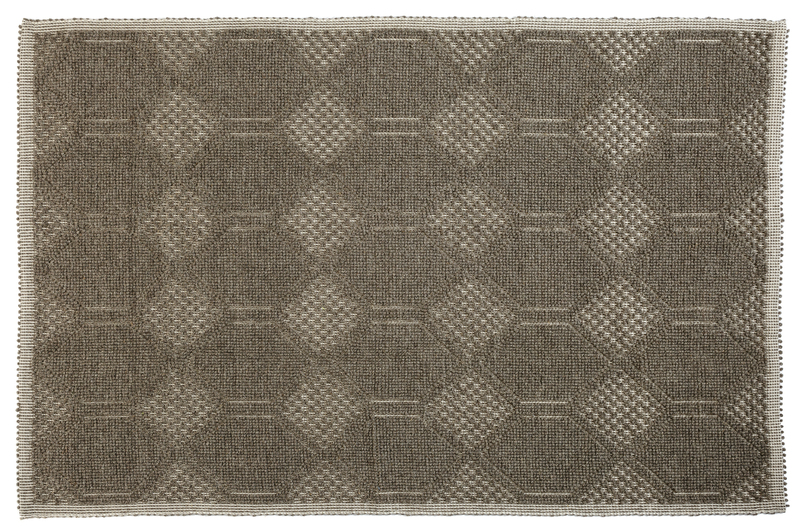 The original geometric composition with large hexagons which characterises this hard wearing carpet, designed with the distinctive personal touch of this textile workshop, is realised in natural grey Sardinian wool yarns according to the a pibiones artisanal relief technique. 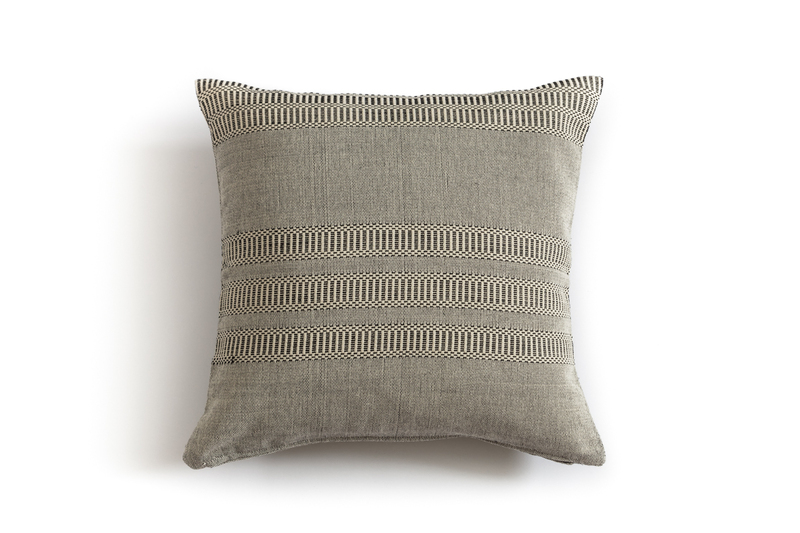 This hand-made cushions is woven on a flat loom, characterized by a contemporary taste featuring white and black decorations inspired by a typical saddlebag. Since the Eighties, in their small workshop, Maria Luisa Fatteri and her sister Licia have been intertwining wefts and warps to create tapestries and carpets featuring strict geometries and colours and contrast, typical of the village of Mogoro. Recently, they have embraces an innovative stylistic research, working with a designer, combining traditional crafts with new compositions and solutions. The result is imbued with a distinctive contemporary touch and deeply rooted traditions. The production includes a wide variety of artifacts intended for home furnishing, such as carpets, tapestries, pillows, tablecloths, bedspreads, runners. Products are strictly hand-made, meeting the specific needs of customers, such asthe customization of size and colour combination and decorative motifs, ensuring the uniqueness of each product, in line with the distinctive style of this workshops. The workshop is characterized by the weaving of tapestries and other artefacts with the refined a bagas technique, performed on cotton, linen and light wool, and embellished with gold and silver threads. On the other hand, as for the creation of carpets, made of Sardinian wool, the a pibiones weaving technique is implemented, this local production being characterized by sturdier relief effects.